This cabin is fully self contained and sleeps up to 4 people. It has a queen bed in the bedroom and 2 single bunk beds just located adjacent to the bedroom in the L shaped living room. Located in Kangaroo Valley just 2 hours drive south of Sydney, this picturesque valley offers the perfect getaway for a weekend or short holiday. 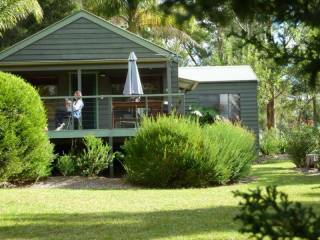 This cabin is part of the Kangaroo Valley Golf and Country resort where the facilities are available to all guests, they include tennis, golf, swimming pool, giant outdoor chess, volleyball and restaurant, laundry and conference facilities. The cabin has a large outdoor deck with BBQ and outdoor setting overlooking lovely views over the golf course and down to the lake. Kitchen is fully equipped with fridge, microwave, stove and oven and all utensils and crockery etc. For your convenience is also a Caffe Italy Espresso machine which takes pods from MAP, Aldi, Woolworths Select and Gloria Jean. Provided for your comfort is quality 100% cotton sheets and Egyptian cotton Towels.